The most up-to-date reference of its kind, Encyclopedia of the American Presidency, Third Edition is the definitive guide to the role of the president from the American Revolution through the present day. Offering a complete account of the presidency in U.S. history, this A-to-Z encyclopedia will make a great first stop for students and general readers looking for information on the executive branch of the American government. Its comprehensive scope spans the relationship between the executive and the other branches of government, court cases, elections, political opponents, scandals, and more. 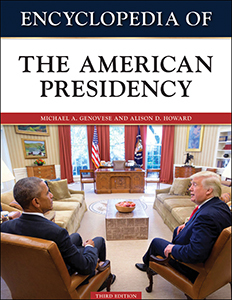 A valuable resource that provides concise information, Encyclopedia of the American Presidency, Third Edition contains more than 700 entries. Michael A. Genovese received his Ph.D. from the University of Southern California and currently teaches at Loyola Marymount University. An expert in presidential studies, he has many works to his credit, including The Presidential Dilemma and The Power of the American Presidency. Alison D. Howard currently teaches courses on the Presidency, Congress, and Campaigns and Elections at Dominican University of California. She received her M.A. degree in Political Science from the University of Oklahoma. Her research focuses on presidential rhetoric, specifically the State of the Union Address. She is the co-author of Addressing the State of the Union: The Evolution and Impact of the President's Big Speech and has published articles in PS: Political Science and Politics, American Behavioral Science, Journal of Political Science Education, Social Science Quarterly, and Perspectives on Political Science.